It is looking unlikely that Hugo Almeida, who has been in the middle of speculation regarding his future at Werder Bremen, will remain at Werder past the January transfer window. Besiktas, Juventus, Lazio, and Real Madrid are all said to be interested. Though the Real Madrid move looks unlikely and the Besiktas move has been played down by Almeida, no moves are ruled out. 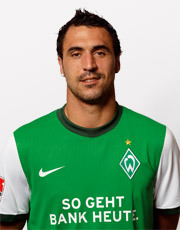 Bremen have tried to no avail to give Almeida a new contract, but the two parties cannot come to an agreement. Besiktas are reportedly interested in signing the burly striker, but Almeida himself has ruled out the move. Edy Reja, the manager at Italian club, Lazio, has stated that he would love to add Almeida to his squad. A move to Besiktas would be the most beneficial, in my opinion, due to the fact that strikers of his build tend to flourish in Turkey (i.e. Makukula). Almeida knows how to score, and due to his lack of speed, a move to Lazio may be beneficial also. The only concern I have in regards to that move is the fact that the last Portuguese player to play at Lazio did not have the best of times (Elsieu).